Home > Share Fundamentals > Top 5 investors in Indian Share Market..! Investing in stocks requires a lot of research and knowledge about the market traits and changing economic conditions. You need to work smartly and understand market traits to receive a decent amount of return on your investments. Visit BankBazaar web site to know everything about NIFTY, NSE, top stock, etc. There are a couple of investors who have cracked the dynamics of stock market and have become successful over the years. Let’s take a look at some of the top investors in India who have become rich with thanks to their smart investment strategies. 1. 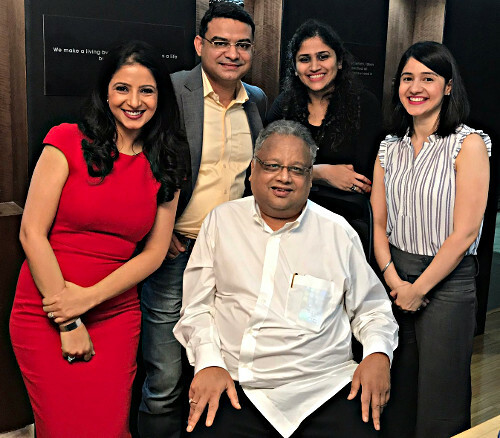 Mr. Rakesh Jhunjhunwala: Popularly known as India’s Mr. Warren Buffett, Mr. Rakesh Jhunjhunwala is synonymous to the Indian stock market. He is one of the most successful stock market investors in India. According to Forbes, his net worth as on 25 June 2018 is $2.9 billion. The 57 year old stock investor forayed in stock when he was in college and started investing with $100 in 1985. The first large income garnered by Mr. Jhunjhunwala was after he sold 5000 shares of Tata Tea that he had bought for Rs.43 per share and later sold them at Rs.143. He owns a private stock trading asset management firm Rare Enterprises. A qualified Chartered Account, Mr. Jhunjhunwala believes in the power of long-term investment. He believes that stock trading is based purely on price and trends. His knowledge and investment strategies has helped several investors earn good returns from stock. He has managed to prompt new as well as experienced investors with decent rewards from investments. 2. Mr. Dolly Khanna: Dolly Khanna is a renowned investor whose worth is valued at more than Rs.700 crore as of November 2017. The Chennai-based investor is married to Rajiv Khanna who invests in her name. Dolly Khanna’s portfolio includes companies like Rain Industries Ltd which has given more than 577% returns since in 2017. NOCIL Ltd., PPAP Automotive, RadicoKhaitan, Som Distilleries, IFB etc. are some of the other companies in her portfolio. As per a report from MoneyControl, over 80% of Dolly Khanna’s stocks resulted in positive returns. In last one year, eight of her stocks recorded an increase of 100%. The couple is stated to have a knack of spotting the right stocks that bound to rope in excellent returns. They have always believed in focusing on the momentum of the stock market. Khanna has been investing in the domestic stock market since 1996. 3. Porinju Veliyath: Another well known investor in the Indian stock market is PorinjuVeliyath. The Kochi based investor owns a portfolio management firm called Equity Intelligence India Ltd. Popularly known as mid cap and small cap expert, Porinju’s stock portfolio includes companies like Force Motors, Biocon, GVK Power, Piramal Enterprises and many more. The 56 year-old investor a portfolio of more than Rs.1,200 crore. Porinju sticks by the strategy of selling the shares if he thinks they are overvalued. He strongly believes that analysing the fundamentals of company before investing is the key to good returns. 4. Mr. Radhakishan Damani: With a net worth of more than $11.8 billion as on 25 June 2018, Radhakishan Damani is a veteran investor in India. He was named the 20th wealthiest Indian by the Bloomberg Billionaires Index in April 2017. In 2002, Damani started the business of supermarket chain D-Mart. He started IPO for D-Mart last year. Mr. Rakesh Jhunjhunwala considers him as a mentor. His portfolio includes companies like Century Textiles, Sterling Holiday Resorts, Gati, Blue Dart Express and others. 5. Mr. Vijay Kedia: Mumbai-based investor Mr. Vijay Kedia has an experience of over 30 years of investing in the Indian stock market. His portfolio includes companies like ABC Bearings, Karnataka Bank, Sudarshan Chemical, Panasonic Energy India, Cera Sanitary, and others. In 2017, Mr. Vijay Kedia's portfolio stocks rose up to 170%. He believes investors should look out for companies that have a good management and invest in that company for 10-15 years. He has often stated that an investor should have patience, knowledge, and courage before venturing into the world of stock market. All of the aforementioned investors have been successful in the stock market as they have worked hard on gathering knowledge about the businesses and have done thorough research about the same.